This year’s race Sierre-Zinal is the 40th year of the event, it is also called the Race of Five 4000m Peaks, is considered to be one of the finest mountain races in the world. It was once written that it is to mountain races what the New York Marathon is to marathons. The oldest mountain race found in its category in Europe’s mountains. 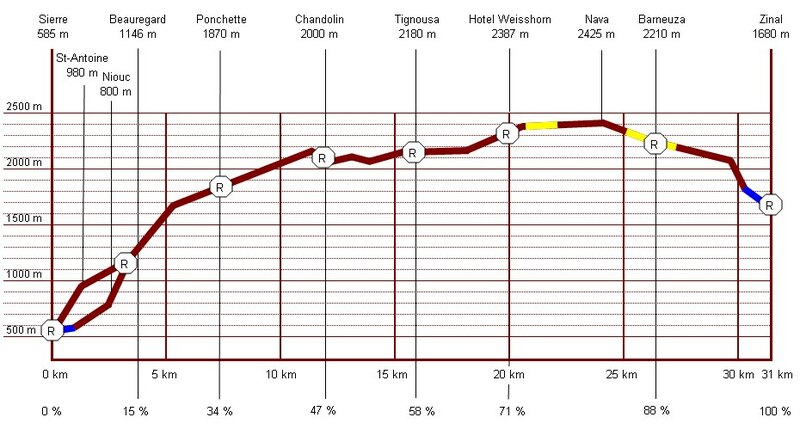 Sierre-Zinal, which takes place in the heart of Valais’ Alps Switzerland, offers its participants a significant challenge: distance – 31 km, 2200m ascent and 800m descent. Incredible scenery, a warm atmosphere and exceptional organisation explain the success and longevity of this challenge. 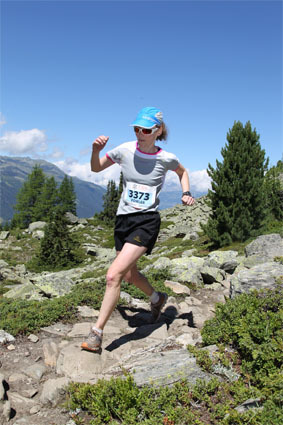 Gill Fowler gives us her race report from a couple of weeks back from Sierre-Zinal. I almost felt like I was lined up for the City to Surf rather than Sierre-Zinal on the 11th of August. My heart had sunk a little as I waited for the last runner’s bus at the train station to take me to the start line 15 mins before the race started. Luckily I’m in Switzerland and buses run to schedule, but a 15 min window is pushing it (even the bus driver thought so!). There were only 5 other runners out of 1400+ who were on the last bus and a friendly Swiss runner assured me, no worries, we’ll make it in time, we’ll just have to start at the back, it will just set us back 10 minutes, or so. The bus arrives near the start, I jump, jog up the road (500 metres to the start area), hurl my bag into the truck, and join the back of the pack. I’ve made it with 2 minutes to spare, so I start squeezing forward, but just like the City to Surf no one is too keen to let me through. I’m still in the back quarter. The race starts, and it’s up! The first 500 metres or so is on road before it hits single trail, and the conga line begins, we must gain over 1300 metres in elevation in the first 7.5km. I start weaving and slipping through (feels like William St here), until the first halt (one of many). Luckily I’m a bit smaller than some, so I start running up the outside of the trail where possible, taking care not to place a foot wrong, as the drop below doesn’t look pleasant. This was my tactic for the first 5km. I was optimistic, I couldn’t go the pace I wanted to, but hopefully it would conserve some energy, and it felt good being the one doing all the over-taking. The terrain started to flatten (slightly) and I had made my way through to runners of my pace. We emerged out of the forest, for some spectacular alpine views, and cheers from spectators, who now often lined the course. Bravo! Super! and Up Up Up! This latter one stopped being a motivator pretty quickly. It was single trail for most of the run, so there was lots of leap-frogging in the 2nd half of the course, as fatigue came and went, and the variation in trail brought out different strengths and weaknesses with other runners nearby. The last 7km is all downhill, but it is not til the last 3km that it really steepens and it becomes almost out-of-control running, it’s FUN! My goal was to keep up and not fall. Success! I even managed to pass a few people. The end result… 3:47. Not quite as speedy as City to Surf pace, but I contested a few more ‘heart-break hills’, and a bit further away from sea-level.